DUNCANVILLE—Coach Cathy Self-Morgan has more awards and medals than Gen. George Patton did after World War II. During her 41 years of coaching Self-Morgan has won 83% of her games, or 1,139 victories to only 209 losses. Self-Morgan has led her beloved Duncanville Pantherettes to five state championships, with three other state victories prior to her arrival in Duncanville 18 years ago. In 2014 Coach Self-Morgan was named the National High School Girls’ Basketball Naismith Coach of the Year and also the Women’s Basketball Coaches Association Coach of the Year. Each succeeding year has brought more and more awards. Each year, the Texas Girls Coaches Association selects one athlete and one coach from conferences 1A-2A-3A-4-A-5A and 6A. Selections are made by the TGCA Basketball Committee at their annual meeting during the UIL Basketball Girls State Tournament, from nominations made by member coaches. Athletes may be selected from any grade 9-12. On April 7, Self-Morgan was inducted into the Texas Girls Coaches Association Hall of Fame. The Player of the Year 5A-6A was Duncanville High School senior Zay Green, coached by Self-Morgan. 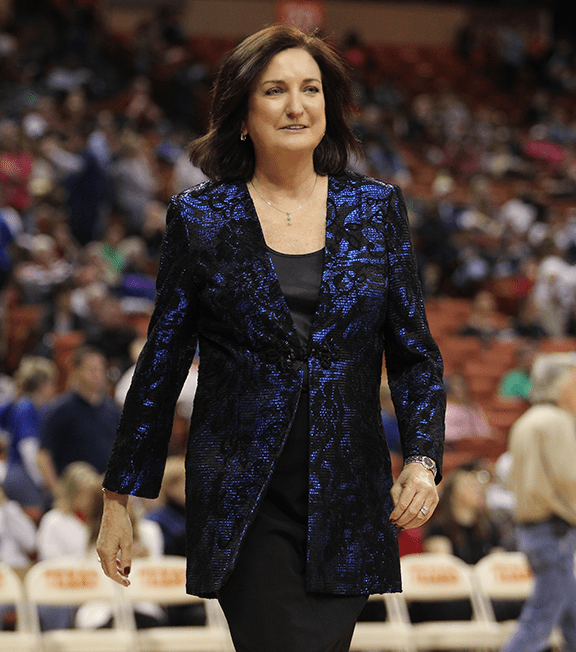 On July 9, 2018, Self-Morgan will be inducted into the Texas Girls Coaches Hall of Fame. Over her career, as Coach Self-Morgan has accrued these numerous awards, she has sought to instill some philosophical ideas into her young athletes. Ideas that have made her one of the most victorious and successful girls’ basketball coaches in modern high school history. “It is never about the fame, but always about the games, the relationships and the players,” she said recently, before a crowd of well-wishers and peers. “I want them to always do their best and become independent, self-sufficient women,” she concluded. Having grown up in an era where girls’ sports and female athletes were not on par with men’s, Self-Morgan has led the charge to change that situation. And she has been successful. Once in a while a great coach comes along. The greatness is not just reflected in the number of victories, but rather in the quality of the victors. Coach Cathy Self-Morgan is truly one of the Great Ones.